In most car accident injury cases the answer is yes, you should hire a lawyer. After you receive medical attention for any injuries you sustain in a car accident, you should at least speak with a personal injury lawyer to determine what you need to do next if you want to seek monetary compensation for your damages. A lawyer is an advocate for his or her clients and as your advocate, your lawyer can guide you through each step of the personal injury claim process and negotiate on your behalf to secure an appropriate settlement amount for your damages. You are not required to work with a lawyer to file and pursue a personal injury claim. Some injury victims, particularly those with minor injuries and straightforward cases, opt to complete the process on their own. But if you are facing severe injuries, permanent disability, expenses that can compound over the years or decades, or a discrepancy regarding which driver was at fault for the accident, it is in your best interest to work with a lawyer who understands the nuances of personal injury law and has experience representing injured car accident victims. 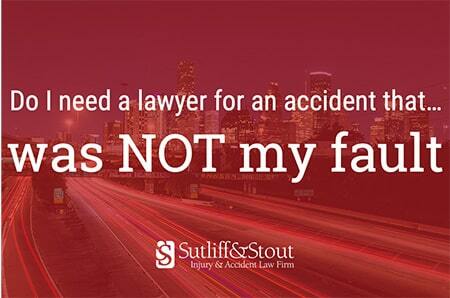 Wondering Whether You Need an Attorney for an Accident that Wasn’t Your Fault? If there is any question about whether you were at fault, having a lawyer can mean the difference between being able to recover damages and not being able to do so. In Texas, a car accident victim can recover compensation for his or her damages as long as his or her fault in the accident was 50 percent or less, but the total amount he or she can recover is reduced accordingly. If another party alleges that you were at fault in your car accident, you can potentially lose compensation money that you are entitled to receive. Also, during the claims process insurance companies will often try to assign fault to you even though you did nothing wrong. By way of example, this office has seen insurance companies try to blame a person who was rear-ended while trying to stop at a stoplight. A lawyer can help you show the insurance provider or the court that you were not at fault. He or she may draw upon his or her professional network to have an expert witness present testimony to support your claim, such as a digital reconstruction of the accident or a biomechanical engineers’ evaluation of the cause of your injuries. Even if nobody claims that you were at fault for your accident, the insurance provider will likely offer you the lowest settlement amount that it thinks you will realistically accept. The problem with this is that you do not know an appropriate compensation amount for the damages you are facing because you do not have the experience handling personal injury claims that your lawyer has. Insurance companies are known to say things such as “this is all the money that I am legally allowed to offer you on this claim.” This statement is simply untrue and you should immediately seek the advice of a lawyer. Your lawyer can review any settlement offers you receive and negotiate with the insurance provider to reach a new agreement that better provides compensation for your damages. In some cases, insurance providers will only negotiate with lawyers, rather than with claimants. Do not use the cost of hiring a lawyer as a reason to pursue your claim on your own. By working with a lawyer who can work as an effective advocate, you can actually come away from the claim process with a much larger sum of money, even after paying your lawyer’s fees, than you would have received if you pursued your claim alone. This is also true when in the context of finding the right lawyer to help with your case. Not all lawyers are the same and you need to find a lawyer that knows what he or she is doing and has the time and money necessary to make sure that you are treated fairly in the process. Another reason to hire a lawyer to handle your case is that doing so allows you to focus on what matters most: your recovery. If you are recovering from an injury, you will need to make lifestyle adjustments and follow a recovery regimen to ensure that your injury heals correctly and within a timely manner. While you focus on your health, your lawyer can handle gathering relevant evidence to support your claim, negotiating with the other party, and making sure that your claim does not miss any critical deadlines like its statute of limitations. On this latter point, if you are coming within a six months of your statute of limitations, you should contact a lawyer. Oftentimes, insurance companies will string you along until after the statute of limitations expires and then tell you that there is nothing they can do and they will not be paying you anything. While this is incredibly unfair, it is nevertheless legal so do not delay filing suit if the insurance company refuses to be fair or is dragging its feet.